The title of this post comes from an email that Toby Archer sent to me last week regarding a possible new line on the left wall of Number Three Gully climbed on January 4 when conditions all over the Highlands were extremely lean. “I was climbing on the Ben with my friend Simon Watchman,” Toby wrote. “Our Plan A (following Chasing the Ephemeral of course!) was Number Three Gully Buttress, but conditions were very bare at the base of the buttress and visibility really poor, so we couldn’t see an obvious way to get up the steep rock to the platform where the route starts traversing up and rightwards. Instead we carried on up Number Three Gully towards the plateau. We went past Gargoyle Wall and Winter Chimney, but not too far beyond them noticed a chimney/thin gully line also on the left. Having dragged all the climbing kit up there, this seemed like a quick target to do some ‘proper climbing’, rather than just continuing to plod up Number Three. I led the chimney-groove in about 50 metres of III,4 to more open slopes not far below the plateau. It would have been possible from there to just climb easy snow onto the top, but Simon climbed a short but fine corner-line in small buttress above. That pitch was about another 15 metres, with the corner itself being fun and well protected climbing at about III,5 although, as I said, completely avoidable! 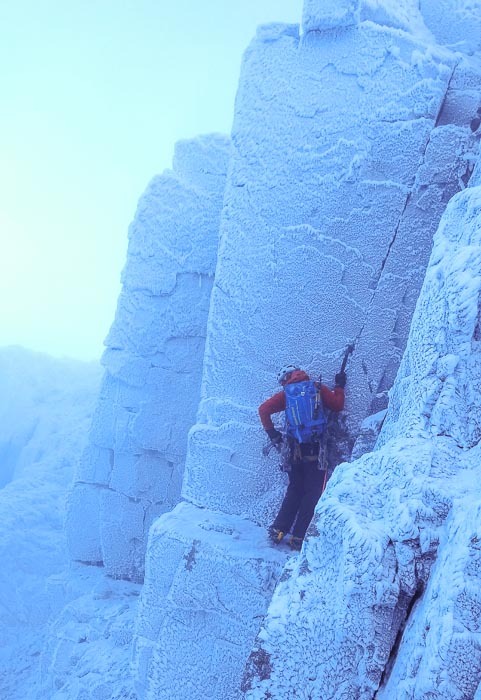 This entry was posted in New Routes and tagged Ben Nevis, Simon Watchman, Toby Archer. Bookmark the permalink.